As great as Alex Ross’s work is, he wouldn’t be nearly as famous in terms of art collecting had it not been for the Warner Bros stores. They got behind his work and promoted it as real art as well as a collectible. His images were some of the crowning glories in the stores, always put in a place of prominence. His new limited editions were released to increasingly committed fans who were quickly becoming completist collectors. I had my own taste of Alex’s enthusiastic fandom when ArtInsights was the first and only gallery to represent Alex Ross Art at a comic convention. We had a booth at New York Comic Con showing only The Art of Alex Ross. Alex’s representatives were kind enough to give us some great exclusive limited editions, and we also had full color and graphite originals. No other art gallery before or since has had that exclusive. Crisis on Infinite Earths Giclee on Canvas by Alex Ross AP1. We released this image in our Alex Ross booth at NYCC. I had been working with what is now the head of the collections of Alex Ross limited editions for over 20 years at that point, and she knew me well, so she knew I would represent the art with integrity and honesty. 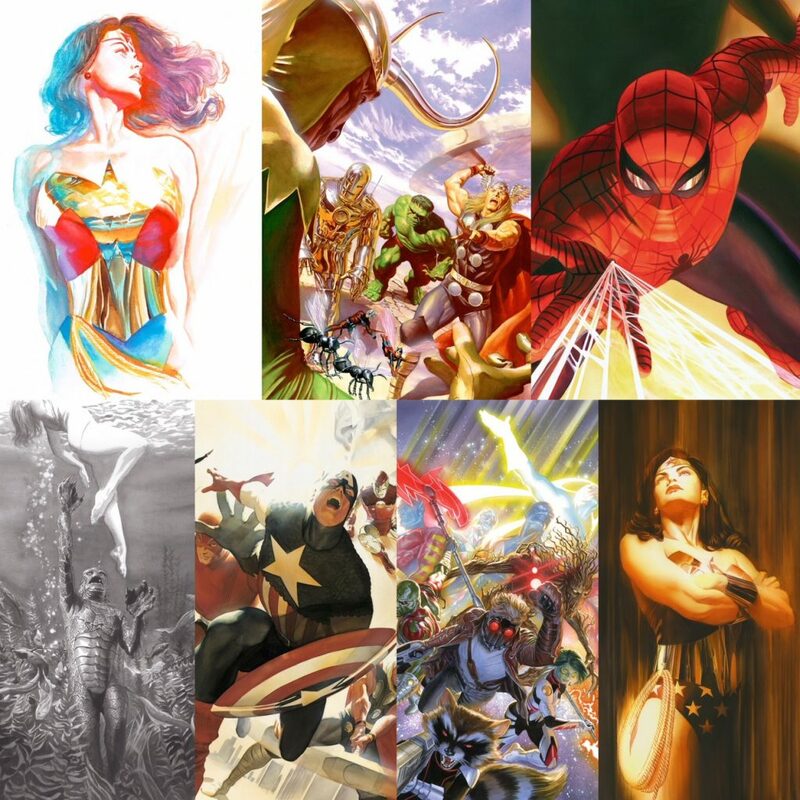 The same agent had been in charge of the Warner Bros. stores before they went out of business, so she knew everything necessary to design and implement a fine art portfolio for Alex Ross. She’d been doing it for decades. From the first day of the convention, we were swamped with convention attendees. Some of them were just fans in love with his work, but not interested in buying art. Others were avid collectors looking to buy the latest exclusive. We had a Doctor Strange, Captain America, and Batman exclusive signed lithograph that we sold out of the first day. Had there been any DC Comics original art of the Justice League, a concern in the far east would have bought every one of them. Alas, he has not been working on DC projects for some time, so there was no art for sale. Apparently this one group will buy absolutely anything, with almost unlimited funds. This is one reason why mere mortal collectors should look to graphites if they want something original of his art. Many people wonder why Alex never comes to conventions. There’s an easy explanation for that, but I think fans and art collectors often don’t consider it. Alex still paints in the traditional way. For the most part, he is not creating inside a computer. He still uses brushes, models, and paint. That means that when other working artists can make adjustments by clicking on the mouse of their computer, Alex Ross would have to completely repaint the art. He is a traditional illustrator in a digital world, but he likes it that way. His idols are Norman Rockwell, Leyendecker, and the rest of the geniuses of twentieth century illustrative art. He was particularly influenced by Andrew Loomis, who was not only a great illustrator, but the author of instructional art books essential to the craft. To my mind, when Alex Ross creates images like the Marvel Shadows and the DC Shadows series, he does his best work. I usually prefer his images of single characters. To my mind, we get to see shadows and light playing on the subject more distinctly, seeing more specific choices he’s making. My favorite images to date, by far, are his images inspired by Universal Monsters. Created entirely in shades of grey, black and white, these pieces show the nuance with composition, shadow, and light only a great illustrator can express. There are times when Alex’s color art is so frenetic and intense, I have a hard time focusing. That’s not to say it isn’t compelling, I just think in Alex Ross’s Dracula, for example, or his Bride of Frankenstein, you almost feel like you could step into the painting and become part of the story. They are at once evocative of the films represented and seductive as unique illustrations, separate from the subject matter. Whether you know the stories or not, you are drawn to the tableaus he has laid out before you. Not only are all the Universal Monsters officially licensed images, the folks at Alex Ross Art got permission and became officially connected with Bela Lugosi and even has the logo of his estate on the certificate of authenticity. Much to absolutely no surprise, his Universal Monsters giclees on canvas were the hit of San Diego Comic-Con. They outsold all the Marvel and DC images! There were only 15 put aside as matching sets, and they are far less than if you buy them individually and we have #13 if anyone is interested in the whole set. 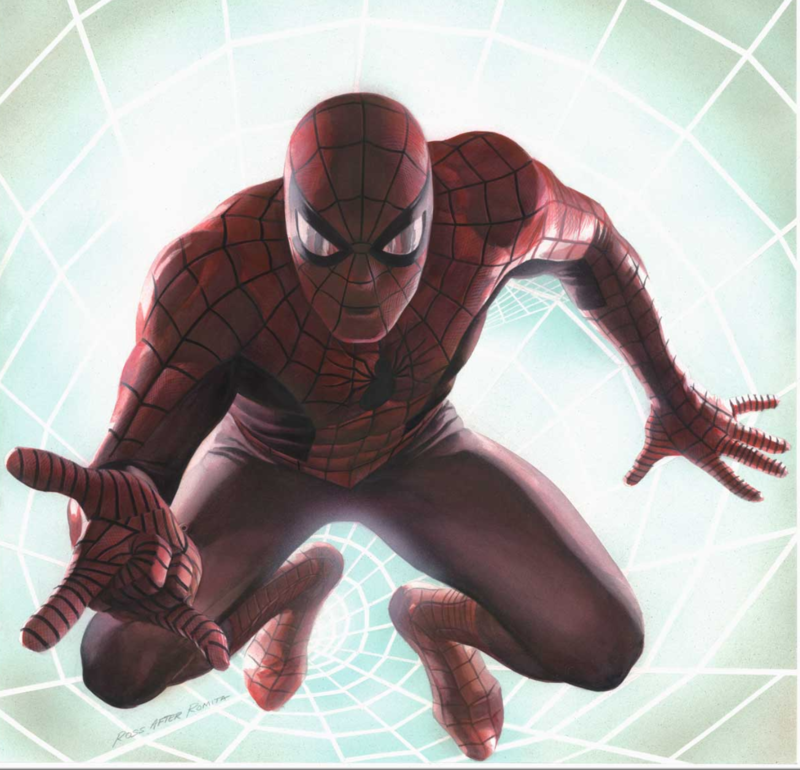 We love Alex Ross Spider-Man art. Whenever we get the opportunity, we get whatever Alex Ross Art releases for our clients. Alex has loved Spider-Man his whole life, and actually his first memory of him is the live-action character on The Electric Company! We have a piece called Rockomic and another very sold out one called Spider-Man Visions, plus the more recent Spider-Man: Marvels. My own memory of Spidey is from the Saturday Morning Cartoon, which was the best! It came on at 6:30 am and I got up especially to see it. Am I the only one who really loves Aquaman? I mean, he’s not just some stupid character to be made fodder for jokes in Entourage! Whether he’s the blonde character I know from the Superfriends or Jason Mamoa, who nearly singlehandedly saved the new Justice League movie, I enjoy having him around to manipulate water, make jokes, and talk to fish… Apparently, Alex loves him, too. If you’re a fan of Captain America (which I am!) and Iron Man, here’s Alex talking about what he enjoys about creating images of these superheroes. And you can find some great Captain America art HERE. One of the latest releases from Alex Ross is of Wonder Woman, and it’s called “Wonder Woman: Goddess of Truth”. After the image was posted on the Alex Ross twitter feed, Patty Jenkins saw it and fell in love with it and sent Alex a note saying how beautiful it was. 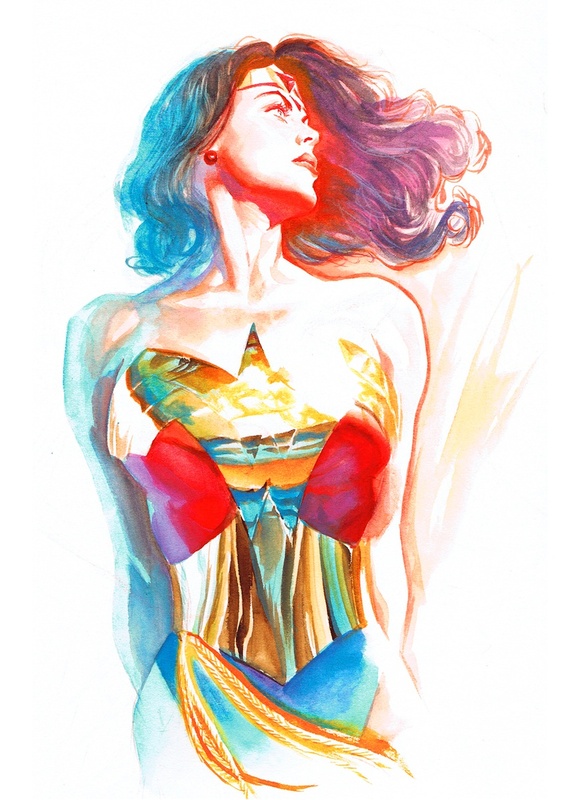 The best aspect of Alex Ross’s Wonder Women: Goddess of Truth is how perfectly it translates into giclee. Giclees are basically a very high-quality ink-jet printer. Instead of only 4 different inks, there are many different ones that spray microscopic drops of paint that read the original within a millionth of a difference in color. This original watercolor gets translated so perfectly, it really looks like the original. Actually, I call it “Colors of the Wind” Wonder Woman, and we only have APs. For obvious reasons it was very popular when it was released and sold out immediately. This image is my very favorite superhero portrait he’s ever done. and for those artists out there, find inspiration here and wherever you go. If Alex can do it, so can you. Make a plan, and stick to it. Work hard, and stay positive. For the rest of us, we can be the vital ones who support these visual artists by hanging their art on our walls!